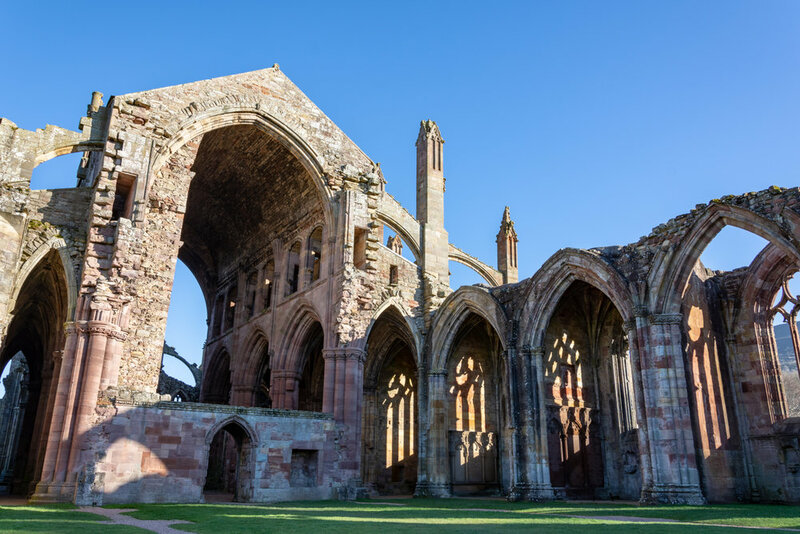 Melrose Abbey is best known for being the burial place of Robert the Bruce's heart, but like many religious buildings, it's had an eventful history. In the 12th century, thanks to advanced farming techniques and wool trade across Northern Europe, Melrose Abbey became a wealthy house of 100 monks and was considered the premier abbey in Scotland. Indeed, it gave birth to the town of Melrose. But, as is so often the case, political violence took its toll on the abbey. Much of it was destroyed in the 14th century by the army of Edward II. Around 60 years later, it was burned by the army of Richard II of England, but rebuilt over the period of about a century. 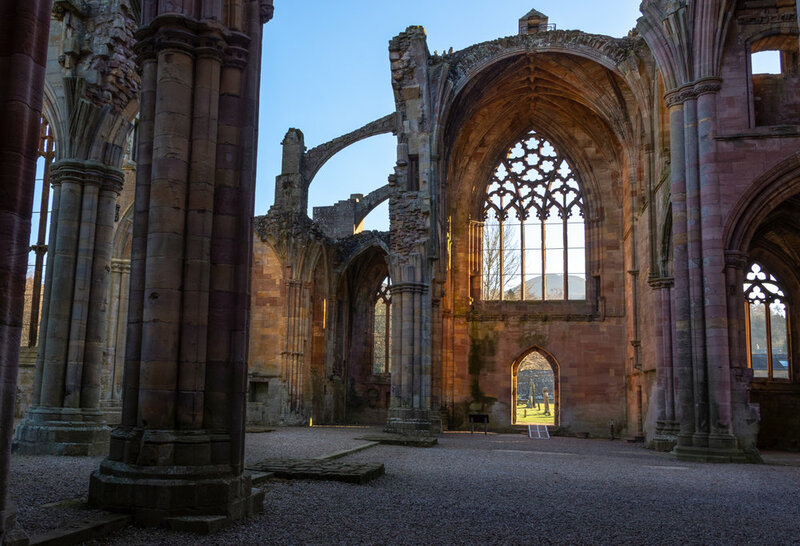 However, it was badly damaged again in the 16th century as English armies rampaged across Scotland and even suffered one final assault from cannon fire during the English Civil War. It seems remarkable that there's anything left of it at all, but thankfully there is. 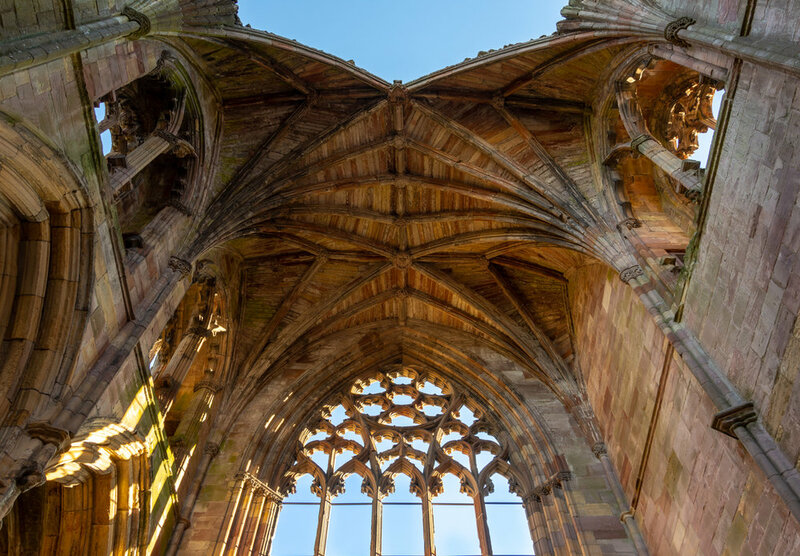 Melrose Abbey is also linked with Sir Walter Scott, who had a passion for Scottish history and who personally supervised extensive repair work done at the beginning of the 19th century. Like a portal into the deep past, the structure that stands today is from 1590. As with any ruined building, you feel a certain melancholy as you stroll through it, but there are enough columns, arches and tracery remaining for it to retain some of that unique atmosphere created by religious buildings built in the Gothic manner. Inside, even though you're technically outside, you still feel protected and peaceful. I was pleasantly surprised to feel that the spirit of a live abbey lingers faintly but firmly in the remains of a dead one. And that was what I hoped to capture in my photographs of Melrose Abbey, which I must admit was a much more stimulating photographic subject than I thought it would be. Well worth a visit. Here's a selection of my favourite photos. (Head over to my Flickr album to see the lot).